In all seriousness, though, I’m going to be writing about racial representation and how New Girl and Brooklyn Nine-Nine, two of my favourite sitcoms, are doing great things in that regard. From top to bottom: Wayans, Morris, Braugher, and Crews. What got me thinking about all of this was a post on the AV Club titled “Fox is changing the landscape for black men on TV“. The article specifically outlines how the network has “managed to quietly introduce some of the most well-rounded roles for black men in the last decade,” with many of them stepping outside of commonly established racial stereotypes. And let me tell you, that’s just great. You know what’s even greater, though? That the diversity doesn’t stop there. Look at Nick not making a big deal out of it. That’s all in addition to the fact that the titular character’s best friend Cece is played by the multiracial Hannah Simone, which means that this current season is actually split down the middle between White and non-White. That is absolutely nothing to scoff at. She’s also all sorts of easy on the eyes, which can only ever be a bonus, I think. But I think it’s time to head over to the 99th Precinct of the New York City Police Department nowabouts. While Braugher and Crews were already mentioned above [and the former is a comedic powerhouse in his own right], it took talking to a friend about the 2013 sitcom to make me realize how its balance may actually tip moreso than New Girl‘s. Of the seven cast members billed during the opening credits, only three of them, Andy Samberg, Joe Lo Truglio, and Chelsea Peretti are what the average person would call White. Joining the aforementioned two Black men are Stephanie Beatriz [credited second!] and Melissa Fumero. 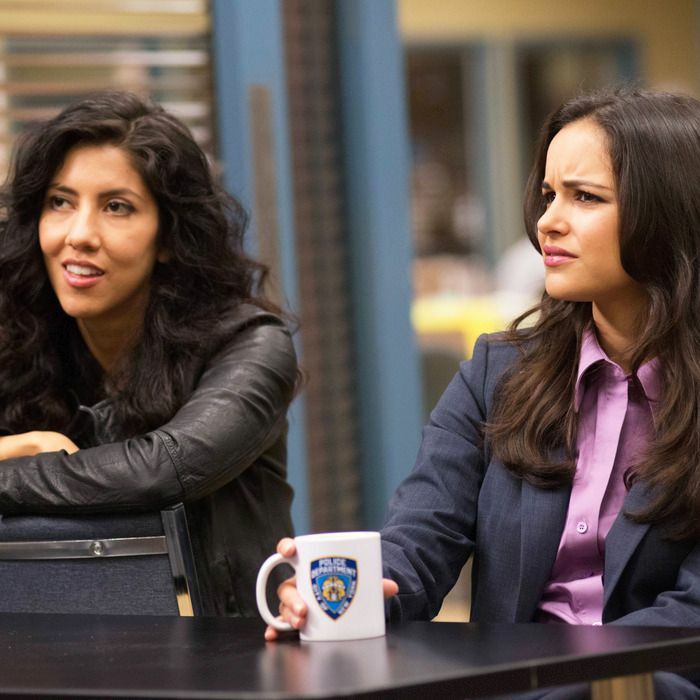 Beatriz plays Detective Rosa Diaz and her parents are, according to Wikipedia, a German-Dutch Colombian American and a Basque-Spanish Bolivian American. Fumero is Detective Amy Santiago, and is adorable. She is also of Cuban descent. Two Latina actresses joining two Black actors on a sitcom that is specifically targeting neither demographic. That’s two shows, people. Two shows where non-White cast members actually outnumber White cast members. That is an enormous deal; that is something that is worth applauding. Honestly, that can only be buoyed by the fact that both shows are the funniest thing this side of the Mason-Dixon line. Also on the other side of that line. They’re so funny that they exceed the bounds of Civil War dividing lines, and I look forward to their Tuesday night comedic goodness every single week. I highly recommend you watch them, but also that you recognize a good thing when you see one. FOX may not have the best track record when it comes to delivering the new, but they can put out a quality sitcom, I will tell you that. These are shows that are more accurately representing the world we live in, and that’s worth some small amount of fame. Oh, and congrats to Brooklyn Nine-Nine for the Golden Globe; I’m going to pretend that award was for Best Comedy Series and for the stellar job you’ve been doing with diversity. New Girl, I’m going to pretend the same thing about your Golden Globes. This entry was posted in Comedy, Fame Day, media, race, television and tagged Amy Santiago, Andre Braugher, black, Brooklyn Nine-Nine, Captain Ray Holt, Cece, Coach, Damon Wayans, diversity, Fame Day, Fox, Hannah Simone, Lamorne Morris, Latina, Melissa Fumero, New Girl, non-white, race, representation, Rosa Diaz, Stephanie Beatriz, Terence "Terry" Jeffords, Terry Crews, TV, white, Winston. Bookmark the permalink. I have watched one episode of New Girl. I continue to laugh riotously while watching Brooklyn 99 alone in my apartment. I only mention the circumstance because a lot of shows will make me laugh out loud if I’m with the right crowd but would not even elicit a smile from me if I’m watching it by myself (See: Parks & Rec, How I Met Your Mother). Brooklyn 99 forces me to pause the episode several times and post the quote I’m laughing about on Facebook just so I can get over it, cease laughing, and get on with the episode. Brooklyn 99 joins one other story that struck me as very naturally and beneficially racially diverse. The other is The Walking Dead (The Telltale game, not the TV show or the books). In the case of Brooklyn and Walking Dead, I didn’t become really aware of the diverse casting until later on in the story, and I had no choice but to admit that it was the best possible decision.